The Indian Constitution posits a separation between a secular domain that the state regulates and a religious domain in which it should not interfere. However, defining the separation between the two has proved contentious—the state is directly involved in the administration of several religious institutions and the courts are regularly asked to decide on rights linked to religious functions and bodies. Such decisions contribute to (re)defining the religious categories and practices. 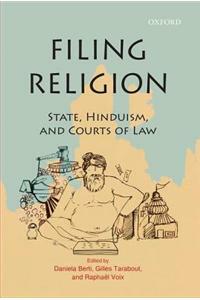 This volume explores how the apparently ‘technical’-legalistic action taking place in the courts of law significantly shapes the place that Hinduism occupies in Indian and Nepalese societies, perhaps even more so than the ideology of any political party. The approach developed in this volume is resolutely historical and anthropological. It considers law as part of social, religious, and political dynamics. The volume does not deal as much with politics of secularism in general, as with how courts deal in practice with Hinduism and how it contributes to shaping contemporary Hinduism. Daniela Berti is a social anthropologist and research fellow at the National Centre for Scientific Research (CNRS), Paris, France, and a member of the Centre for Himalayan Studies (CEH), Villejuif, France. Gilles Tarabout is a social anthropologist, Emeritus Senior Fellow at CNRS, and a member of the Laboratoire d’Ethnologie et de Sociologie Comparative (LESC), Nanterre, France. Raphaël Voix is a social anthropologist and research fellow at CNRS, and a member of the Centre for Indian and South Asian Studies (CEIAS), Paris, France.